This ship, the third of six Anchor Line ships to carry this name, was built by D. & W. Henderson of Glasgow. Launched in October 1904, she made her maiden voyage on Anchor's Glasgow-Moville-New York route on 25 March 1905. She remained on that route through July 1914. Then, when the first World War began, she was requisitioned as a troopship, at various times carrying troops from India to the Mediterranean, from Canada to England and from England to the Mediterranean. Caledonia was torpedoed by U65 on 4 December 1916, 125 miles east of Malta. 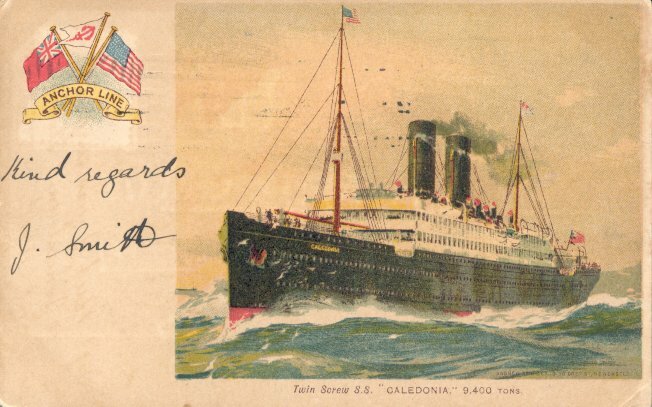 En route from Salonica to Marseilles, Caledonia was carrying mail but no troops; consequently there was only one fatality. After he tried ramming the U-boat, Caledonia's Capt. James Blaikie was captured and was destined to be executed as at least one other merchant marine commander who had tried a similar maneuver. After the British government promised to execute a captive German officer in retaliation, the Germans relented, and Blaikie spent the remainder of the war in a prison camp.